After my post a while back about one of my favorite ways to dress up an angel food cake, I must have received a dozen comments both in email form and in person from friends saying they were shocked I don’t make my own homemade angel food cake. I know, I know! I’ve tried, trust me, and the results were disastrous – which, combined with the fact that I wasted a dozen eggs convinced me I should stick with the boxed version. However a few days after that post, my friends, Meg and Bruce, dropped off one of the most delicious cake I have ever eaten. A lighter-than-air chocolate angel food cake slathered in french cream frosting. Oh my. I must have eaten five pieces. And then I called and demanded the recipe. A few of the merits: no cake flour! Yahoo. I never have that on hand but I’m always good for some all-purpose, and the baked cake still manages to be tender and silky and light. Also, the original recipe is for a basic angel food cake with a simple variation to make it deliciously chocolate. Try either lovely version! I topped my confection with whipped cream and strawberries, but this cake would be delicious doused in ketchup, I swear it is that good. Most of all, I’m so proud I finally conquered a homemade angel food cake. Thanks, Meg and Bruce – this is definitely going in the Best Recipe section! In a medium bowl, whisk together the flour, cocoa powder (if using), sugar and salt and set aside. In another bowl place the egg whites and add the vanilla. 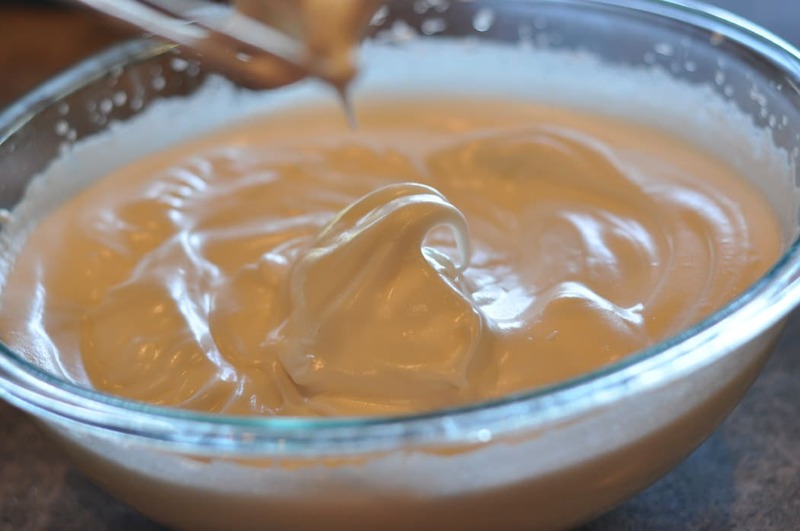 With a hand mixer (or with a stand mixer), beat the egg whites and vanilla on medium-high until the mixture is just frothy, about one minute. Sprinkle the cream of tartar on the top of the foamy whites and continue beating on medium-high until soft peaks form, another 2-3 minutes. Add the sugar 1/4 cup at a time until fully incorporated. Continue beating until the whites are stiff and glossy (see the picture below). This may take several minutes, depending on the type of mixer you are using. With a whisk, gently fold the dry ingredients into the beaten egg whites. Pour the batter evenly into an ungreased angel food cake pan and smooth the top with a rubber spatula. Place the cake on a rack in the center of the oven and bake for 40-45 minutes, until the top of the cake is golden brown, the cake springs back when lightly touched and the cracks are dry to the touch. 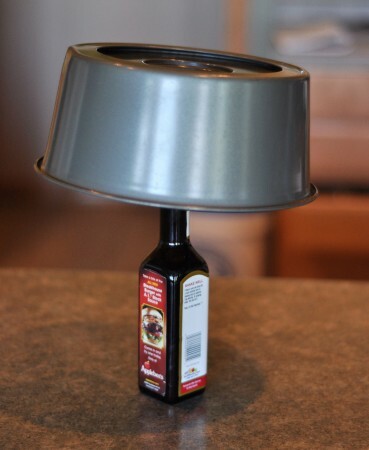 Place the cake upside down on cooking rack or bottle until cool (see picture below). Slide a knife around the edges of the pan and gently remove the cake. To make a chocolate version, substitute 1/4 cup cocoa powder for 1/4 cup of the flour. Recipe Source: from Meg and Bruce M.
Here is what the egg whites should look like when beaten to stiff peaks. A-1 is my bottle of choice for cooling this majestic cake. Haha, no shame in Hershey’s cocoa! 🙂 It’s my preferred for an all-purpose natural, unsweetened cocoa powder, but I also keep Dutch-process on hand because I use it in a lot of things and I think it’s tasty in this cake (although if I’m being honest, I usually use Hershey’s for this). I think right now I have the Droste or Guittard brand of Dutch-process. Hey, Mel! This looks delicious! We’re at a mile high in Denver (insert pot jokes here if you wish /: ) and I have an angel food cake recipe that works great for me; it uses cake flour, though. What do you think about subbing the cocoa in for 1/4 cup of the cake flour? If you’d give that a go, would you suggest I go with the combo that I use of vanilla and almond flavoring, or stick with one or the other? I hope you know we all love you–and your yummy recipes! Ooh, quick reply! 🙂 I’ll give it a try and let you know–in case any of your peeps would be interested! Thank you! I do not have an angel food cake pan – is there another pan I can use? I think you can split the cake batter up into loaf/bread pans and bake it that way. Is it possible to substitute egg white powders in lieu of actual egg whites? I know, I know…I’m lazy. I’m not sure I would recommend that only because powdered egg whites have a different taste (a little artificial) and I think it would affect the overall flavor. This was ah-mazing. I can’t stop thinking about it. This is my new bake-to-impress dessert. So good. This was a-mazing. SO GOOD. That is all. Hi Marilyn – I think if you use the full amount of flour AND add 1/4 cup cocoa, the cake will be dry. Neither flour nor cocoa has rising properties as far as I know, it’s due to the eggs and other chemical reactions that cause the cake to rise. I make it chocolate all the time by decreasing the flour by 1/4 cup and it works great. Keep in mind that this cake isn’t quite as tall as an angel food cake from a box mix. This looks delicious! I’ve loved every recipe of yours I’ve tried. You’ll have to try out Ina Garten’s Angel Food Cake. It’s to die for! And for egg yolks? Her Double Chocolate Pudding takes 6…mmm. I made this today, and it was so easy. I bought a carton of egg whites for simplicity, and made the chocolate version. Thanks so much for this!! Ok. I need to preface this by saying I’ve never made/eaten/seen/touched Angel Food Cake. It’s not something I’ve come across in NZ or the UK. Soooo, I think, how hard can it possibly be? I’ve made a lot of the recipes on this site, adjusting ingredients as I go, they’ve all, without exception, turned out perfectly. I’ll make it in my cute little 30 HOLE CAKELET pan. That’s right. I attempted to make AFC into THIRTY cakelet’s. And, yes (sigh), I did read the recipe without once thinking about the ingredients and what sort of texture they would produce. Anyhoo….long story short (which does involve eating them right out of the pan because they aren’t just gonna ‘plop’ out nicely), I had enough left over to make an actual cake, served it up with fresh raspberries and creme anglaise – delicious! bdubz – thanks for the laugh, although I feel badly laughing at your expense!! I can’t believe all the work that must have gone into making 30 mini angel food cakes but I’m glad you had enough left over for the real thing – and served with fresh raspberries and creme anglaise, it sounds positively dreamy! I was wondering if you can freeze this cake to save for a later time? Finding a way to get a chocolate fix while dieting and fighting high cholesterol left me feeling more than a little cranky. This cake is a lifesaver! AmyLeigh – your comment made me smile! I’m so glad this cake manages the crankiness. It sure does for me as well! I’ve never made an angel food cake before, but this one looked so delicious I just had to try. It came out absolutely perfect. Light and delicious with a perfect hint of chocolate!! My whole family loved it and my dad said it was the best cake he’d ever eaten. I will definitely be making it again. Thank you! Carlee – I’m thrilled you had good success with this cake! For those worried about sugar — I’ve successfully made angel food cake by subsituting the pourable Splenda 1-for-1 for the sugar. The cake is a little chewier than the oh-so-fluffy full-sugar cake (about as chewy as box-mix angel food cake) but very satisfactory. Be sure to use the Splenda from the yellow box, not packets. The packets are much sweeter. Mel, this looks so delicious! 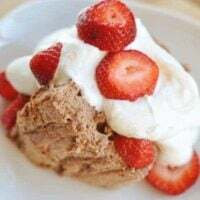 I love fresh strawberries and homemade angel food cake sounds awesome! I’m so excited to try this! I’ve never been a fan of store bought angel cake, but I do so love me a betty crocker box mix!! It is a family favorite. And now I’m very excited to try this from scratch! This looks great, I don’t have a pan to make it in, but when I get one, ooh boy! 🙂 Any ideas on what to do with all those egg yokes? Nicole – well, it ain’t healthy, but a good pastry cream or pudding is shouting to be made with the egg yolks. It’s been years since I’ve tried to make an angel food cake from scratch – I need to give this one a try! Meg and I are glad you liked it. Thanks for posting the recipe, it makes us feel a little famous. Does there have to be so much sugar (I try to avoid such large amounts) ? Is there a way to reduce it or sub something for it? Katherine – angel food cake is notorious for it’s lack of fat and oil; however, it does have a fair amount of sugar to sweeten it up. 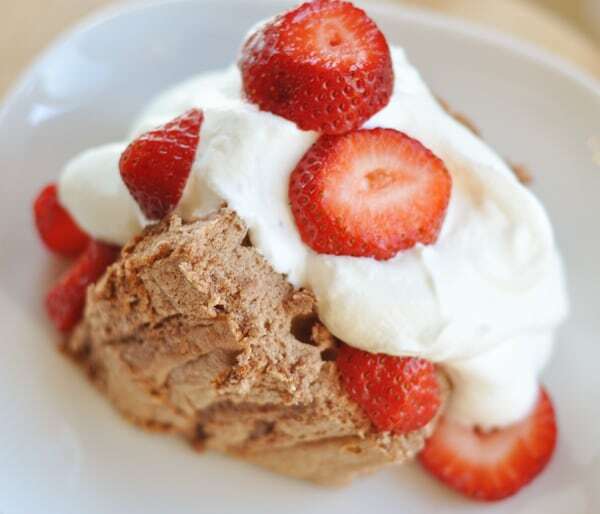 I searched through many angel food cake recipes after reading your comment and I didn’t find a recipe that called for less than 1 1/2 cups of sugar – it sounds like that is the standard for this type of cake. You could always try to decrease it but I can’t guarantee the results will turn out. Let me know if you try it. That looks amazing! I have always been a fan of angel food cake, and I’ve often wondered why you don’t see it with a chocolate flare. Yours looks fantastic! Veronica – french cream frosting is absolutely delicious but I haven’t actually made it myself yet, which is why there isn’t a recipe. Plus it calls for raw egg yolks, which some get nervous about. But I guarantee when I make this cake with french cream frosting, I’ll post the recipe! It’s been almost a year since I made angel food cake. I will try this chocolate version next. This looks so good and I really want to try it. Could you bake it in a bundt pan instead of an angel food cake pan? Emily – the real answer is…I don’t have the answer. I want to say yes so that you don’t have to get a special pan but I’ve never tried it that way. From what I’ve read on the internet, it can be baked that way but basically you’ll have to spoon the cake out of the pan to serve it, instead of it coming out on it’s own and slicing nicely. Anytime I make a recipe and it flops, what upsets me most is wasting the ingredients. I just posted hand pies on my website, and I couldn’t begin to count the number of times the recipe failed. Trashing the dough is okay, but trashing expensive berries? No ok. I would really like to try this recipe someday! Thanks for sharing! 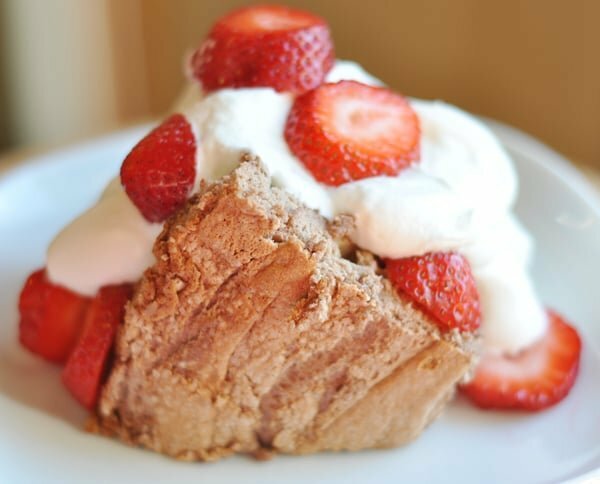 I adore chocolate angel food cake. My grandma used to make it. I haven’t had it in years. So delicious!